This morning we left 79th St. at 8:30 and caught a favorable tide. We made Ossining in about three hours and waved to Karen’s parents as we passed their apartment. Just above Peekskill the river narrows (and deepens–100-plus feet deep) considerably as one approaches the Bear Mountain Bridge (which is hopefully visible in the photo). This stretch from Peekskill, past West Point and Cold Spring, to Pollepel Island is certainly the most dramatic landscape we’ve passed through thus far (and perhaps the most dramatic we will pass through on this trip). 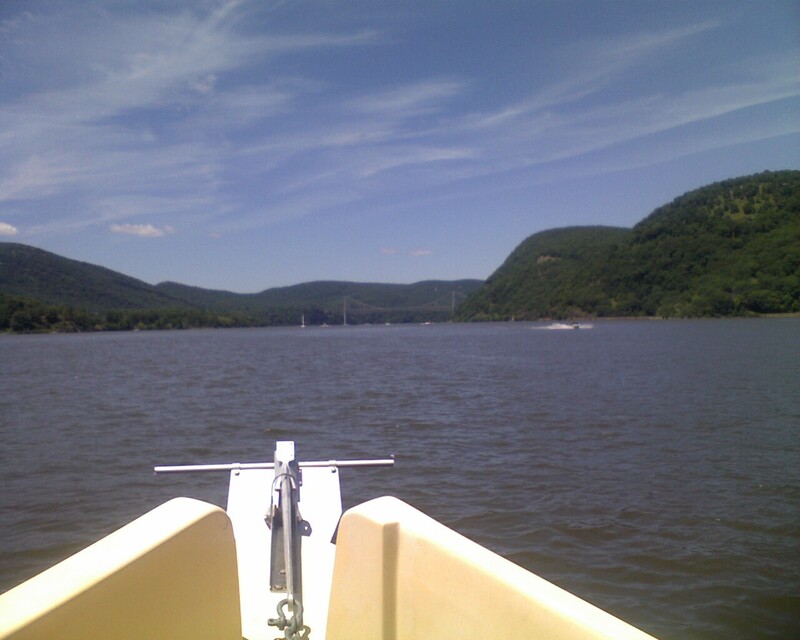 As the river narrowed and twisted past Bear Mountain the sides rose steeply over us. Just beyond the imposing walls of West Point we passed the evocatively named World’s End (although there wasn’t much to see there). A slight detour out of the channel brought us close to Cold Spring’s waterfront park so we could wave at people and they could wave back. Storm King mountain stands guard on both sides of the river just above Cold Spring and graciously allowed us passage to Breakneck Ridge, where we snuck between Pollepel Island (site of the ruins of Bannerman’s Arsenal) to the west and the Hudson Highlands to the east. There was quite a difference from the last time we were here. Seven and a quarter hours after leaving Manhattan we arrived at Front St. Marina in Newburgh. There’s a lot of history here (such as George Washington’s HQ), but it will have to wait for another visit. The river calls us farther north. The waterfront in Newburgh has restaurants, bars, and tour boats. Karen wondered why her hometown of Ossining didn’t have a waterfront like this, but we realized that the prime waterfront property there belongs to the prison. The sun is now setting and gently coloring Bannerman’s Arsenal, visible about four miles down the river.